Weekend sales of Apple's iPad 2 were stellar with as many as 500,000 tablets sold to mostly new tablet owners, according to Piper Jaffray, an independent market research firm. Sales of the iPad 2 were up 67 percent compared to the launch of to original iPad when Apple sold 300,000 tablets. The figures reinforce Apple dominance in tablet sales as first-time tablet owners flock to the iPad 2 and not tablets such as Motorola's Xoom tablet based on the Android mobile operating system. Piper Jaffray says it spent the weekend calling Best Buy, Target and Apple Store locations to get a handle on availability for the iPad 2. It discovered most stores were sold out. "We were unable to find any availability," wrote Gene Munster, Piper Jaffray analyst, in a research note Sunday. It's unclear how many stores Piper Jaffray called to determine iPad 2 availability. Apple's online store currently indicates new iPad 2 orders will take three to four weeks to ship. On Friday, the iPad 2's shipping window was one week. 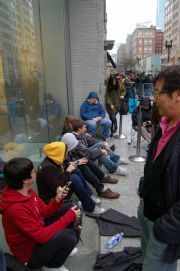 Piper Jaffray says it surveyed 236 prospective iPad 2 buyers in line at Apple Stores in New York and Minneapolis. Piper Jaffray determined that about 70 percent of iPad 2 buyers didn't own the original iPad, suggesting the iPad's user base is growing. It may also signal that original iPad owners are less interested in buying the latest and greatest version of their tablet compared to iPhone owners. During the iPhone 4 launch Piper Jaffray determined an overwhelming 77 percent of people lining up for the new smartphone were already iPhone customers. It's easy to see why sales were stronger than the original iPad. When Apple released its original iPad it was only sold at Apple stores, unlike the iPad 2 sold by Apple and retailers AT&T, Best Buy, Verizon Wireless, and Wal-Mart. It's entirely possible that Apple sold as many as 500,000 iPad 2 devices this weekend, but it should be noted Munster is usually bullish on his predictions for Apple product launches. In 2010, Munster predicted iPad sales would hit 600,000-700,00 in its first weekend of availability, but Apple sold only half that amount. In June, however, Munster's bullishness paid off when he said he expected Apple to sell as many as 1.5 million iPhone 4's in its first three days of sales. Apple later announced it had sold 1.7 million devices during that time. While regular users may be excited to get their hands on the new iPad 2, DIY-minded folks might want to stay away. The teardown masters at iFixit scored Apple's new device as a 4 out of 10 for reparability, and said the tablet's front glass can shatter easily when trying to repair it yourself. If you missed out on iPad 2 mania over the weekend, but would still like to experience the thrill of seeing a new iPad 2 for the first time. Check out PC World Editor Ed Albro's iPad 2 unboxing.